Interesting. I still haven't engineered a travel lock for our LCD install - so far I am just living with its propensity to work its way out an inch or two. I had to modify my TV installation. It wasn't unexpected. I knew that I might need to secure the TV when traveling. When driving the TV would tilt forward over time and start rattling. 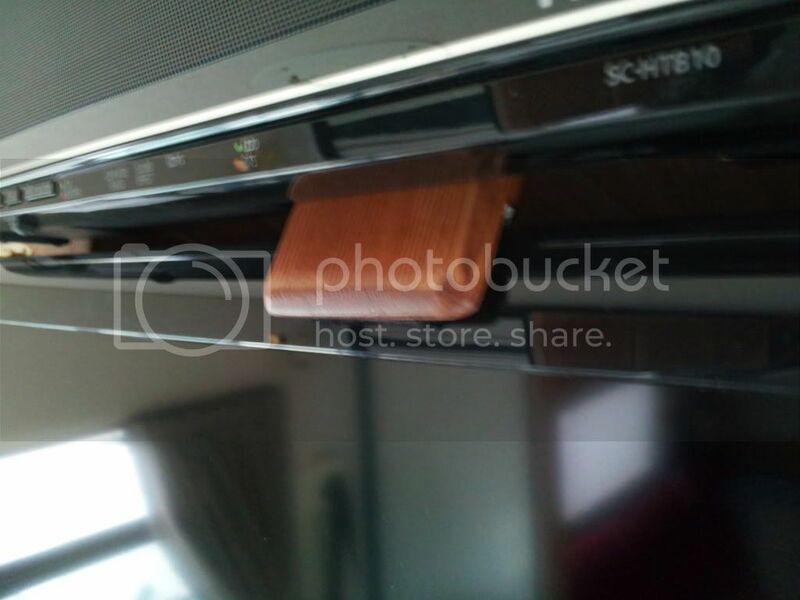 I made a wooden clip that sits on top of the TV and wedges behind the sound bar that keeps the TV from tilting forward. Another problem: I was not able to control the sound bar volume with my DirecTV remote control. I have searched for a DirecTV remote code but none worked. I contacted both DirecTV and Panasonic and neither could help me. I connected the sound bar to the TV using an optical cable. I read last night that someone connected the sound bar to their TV using a HDMI cable and they were able to use any remote. I just tried a HDMI cable and it works. I can now control sound bar volume using the DirecTV remote. Thanks for the report JD. I can't use a wedge like you did - I need to get brain cells working on solving my problem. I'm not familiar with your sound bar - I suppose it contains its own amplifier? Getting close to being done. I did things a little different. First the background; '04 Adventurer, 26" Sony CRT over the dash, replaced with 32" Panasonic. What I did differently is to totally remove the face frame, the plastic shroud underneath, and the metal frame that held the original TV. Biggest surprise to me was how much the metal piece I took out weighed; 40 pounds! That and a 77 pound TV means I'll loose almost 100 pounds with the new setup. I modeled the setup after what is done in the Sightseers with front flat TVs. After I had it all removed, I just installed a piece of wood just behind the cabinet faces on the sides, made a hole in it access the connections. Only comes down as far headliner on the bottom. Carpeted the new panel with cheap black automotive style carpet. Simple non-adjustable mount for the TV bolted to the new panel. The new TV only hangs a few inches below the cabinets on either side. I need to make a new headliner still, to cover where I removed the plastic shroud, but some luan and some cheap tan vinyl will take care of that. I will be adding some powered visors at the same time, no old holes from that swap is a bonus. Some damage from the old face rubbing on the "wood" of the side cabinets to deal with sometime, but that is mostly cosmetic. Took a quick pic in the dark last night, gets the idea across, nothing left of the original TV setup. Just finished my TV upgrade in my Winnebago 06 31C Outlook that has a overhead entertainment center. Sorry no pictures! I changed out the 25 inch RCA with a new 26 inch Samsung flat screen. I used 3/4 inch finish plywood to construct a 4 sided 6 inch deep box to fit the opening of the old TV. Then a 3/4 plywood back was added also. I mounted the box on the inside of the opening resting it on the original steel frame on the bottom of the opening. Then holding the box against the opening I screwed it into place thru the original outside trim. Covered the 4 countersunk holes with wood plugs and stained everything to match my original Winnebago trim. I held the TV in place by drilling 2 counter sunk holes thru the bottom plastic base. I just have some packing material holding the top of the TV for now while traveling. Don't forget to take it out while playing the TV because of heat buildup! What a great looking upgrade, if I do say so myself! Just took the Vectra on a twenty mile warm up run to fill it with propane for the Winter. The new Flat screen stayed put with the Mor/Ryde mount, didn't rattle or make noise, I guess the project can now be determined a success. I have a different angle of attack on this one. My 2004 Vectra 40AD has the side mounted TV but it's not where I want it even if it was an LCD. I saw some new models that had a TV mounted in the buffet and a motor to raise it up and down to hide it away when travelling. The buffet is where we really wanted the TV. The usual place is no directly accross from the recliner and the TV can't be seen when at the table eating so we decided to temporarily let the TV just sit on the buffet and to lay it on the bed when travelling. I'm going to experiment with an idea of putting an eye hook or two above the buffet and hooking a bungee from the eye hooks to the tv when traveling and taking the bungee off for appearances when parked. Velcro under the TV's stand would keep it from moving side to side. I got a 32 inch LCD LED that is VERY thin and weighs only 18 pounds. This is not an elegant solution but we will live with it for a while to see how it works until we come up with a better idea. Trav'ler satellite dish for direct TV is also being installed. We LIKE everything we like.... We are nevr just CAMPING. This TV is in my 1989 Itasca. I would like to replace it but we are not interested in a large TV. I would like to fill the same space with a new digital TV. I would appreciate hearing some ideas on how to do this. Others have gone before you - there are six pages of ideas in this thread, many are over-the-dash conversions. I have a Sunrise 32V. We do not like looking up at an angle to watch TV. The easy chair that normally sits behind the passenger seat was not there when we purchased the unit so Cleo the dog sleeps there. I'm taking about 8 inches of the floor space and installing a flat screen with a lift. Using a lift as I will be blocking a window when watching TV. Will make a cabinet to match current wood work which will hide TV and lift when not in use. This is a work in progress and will post some pictures when it's done. The existing TV location will be modified into a storage cabinet for DVD and what ever. Rear TV has been removed and space turned into a towel storage cabinet. Purchased a 32 inch Samsung LED/LCD from Costco for $376 CND and have been using it a little in the house to break it in prior to install in MH. I would look for another area in your MH if possible. The space/TV looks small. Just my 2 cents. Thanks for the update Art! Newbie here. Purchased a 2001 Itasca Horizon 35' from FL last spring now in winter storage in northern IL. I banged my head too many times on bedroom CRT-TV cabinet which I'd like to remove and replace with a wall mounted LCD-TV. How difficult is it to remove the cabinet and will there be ceiling material behind the cabinet so it doesn't look strange? The front LCD-TV is next but that seems to be well documented here. Any info/thoughts/encouragement welcome. Thanks. Hard to say what's behind cabinetry - for my front and bedroom TV, the area behind the TVs were unfinished so some woodworking was required to finish off the space. Trooperbart, there is ceiling material behind the TV cabinet. Mine is an '02 Horizon, so I think it's the same as your's. I removed the TV and corner cabinet this afternoon, and it was a bit of a PITA, but not too bad. The problem I had removing it, is that the metal strap that clamps the TV down, is glued to the top of the set, and screwed to the bottom shelf on each side. Had troubbe getting those screws out, as there is no clearance. So I removed the bottom shelf from under the cabinet, and that allowed the tv to tilt backwards, then I could push it back at an angle, and get to those screws. Once the TV and corner cabinet are removed, what you will find is a 21" by 22" hole in the wall. There is no paneling behing the TV. But the ceiling material is there, all the way back to the wall. Now that I got the old TV out, I don't yet know how I will mount the 26" flatscreen that I bought (which has controls and a built-in DVD player in the left side). I am open to suggestions. 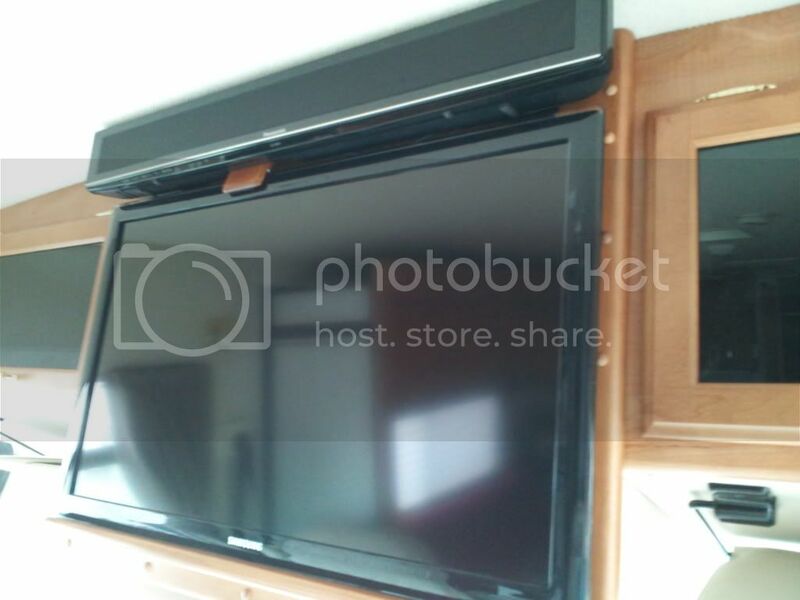 May install a piece of plywood over the hole, and mount the TV to it, using a wall bracket, or I may need to spring for a piece of cherry veneer plywood for the project, as the interior cabinetry in the motorhome is cherry. I don't think stained plywood would look all that good, even though it will mostly be behind the TV. ANyone have some pics of their bedroom TV project, from '01-'02-'03 Journey/Horizon? Is it just me or were the designers drunk on hard liquor when they decided to put a TV screen in a position that is really uncomfortable to watch. Moving mine to sit opposite of the sofa where it really should sit. I agree. I guess putting tv over the driver and passenger's head was to get it out of the way. That is one the main reasons that we bought a Winnebago Voyage with the 38 J floor plan, as the tv is across from the recliners we have installed. Different strokes for different folks. We prefer the TV overhead. We can enjoy the outdoors while watching and our new LCD installation tilted the screen a little downward to give a very good viewing angle. Great thread - thanks John for starting it. We're arriving in Casa Grande, AZ next week for 3½ months, and my priority job is to replace the hulking great Squeak-Monsta as soon as possible with a 26" or 32". I'll no doubt be whimpering on here in due course! I found a 26 inch flat screen at Walmart to fit in the space my 25 inch RCA dinosour. What a great upgrade! Scott - we need pictures!! Yeah - c'mon Scotty! Beam us up! I just looked at some fantastic work above. I will be picking up a Winnie 35A Adventurer, 2005 - new to us - in a couple weeks. First thing is to get rid of CRT's. I have an LG in our Pace Arrow that is a 32 inch. Measured from above and have about a3/8 inch difference to be able to use the same again. Anyone done this particular coach? ANd thanks for the group. Good advice. Hi and welcome aboard! The Adventurer is a very popular model - you should have lots of company here. Anyone have a step by step guide to getting the shroud off the main TV in the 2005 Adventurer we just got? I got the rear TV out and since it had a bad power supply -- it's in the dumpster. Now it's time to replace both and I want to wind up with storage compartments behind both. That's several cubic feet of good space. My Aero Cruiser came with a 9" 120v/12v CRT TV in a custom full side to side fiberglass enclosure that is part of the roof and forward structure. Thankfully(?) at some point someone changed it to a huge 13" CRT TV 120V only...but hey, it had a VHS VCR built-in! All kidding aside, I hated it. Wanted better resolution, lower power consumption and lighter weight. LCD tvs were a natural swap. Of course this being ME there was no LCD TV that would fill the cutout. It's a 4:3 (nominal) ratio and 4:3 TVs are hard to find. besides I wanted more resolution for a better picture from other digital sources like streaming media, my laptop, etc. I had to find some way of showing composite TV and everything else including directv, and vga all on this LCD computer monitor. Doesn't sound like we have any specific help for your Adventurer here . Give Winnebago Owner Relations a call Monday and ask them. The front TV was an option (61E). The wiring was not installed for this (according to Winnebago) in my motor home, but all I need is the TV Coax which I can access from the wall plate by the passenger seat. So, I have almost completed the installation - almost meaning I need to add a little trim work. Will start with wiring. I contacted Winnebago Customer services and asked if the wiring was pre-installed. They advised that it was not. The wiring consisted mainly of an antenna cable and a composite video cable and audio cables all coming from the entertainment center in the center of the motorhome. As mentioned above I had a TV outlet by the front passenger seat, and that tested good, and it is controlled by the "TV 2" switch on the video switch. "TV 2" also controls the bedroom TV and the antenna outlet for the external entertainment area inside one of the bays. So, I knew that all that would be required would be a coax run from the passenger seat to the front overhead cabinets. (Photographs are attached and I will try and explain them here - this will be lengthy) I knew by looking at the wiring diagrams, it showed that there was a junction block in the antenna coax from the center entertainment center to the passenger TV outlet and that a coax cable off this junction block went to the front TV. I started by removing the wall plate that the passenger TV jack was connected to. I found the coax, unmarked, (as per Winnebago Wiring Diagrams) going to the back of the cabinet it was mounted to. To really find out where it went, I had to remove the cup holder adjacent to the passenger's seat. Once the cup holder was removed, I found that the coax entered the wall to the rear of the passenger seat window. I then deduced that maybe it went forward and up the passenger side A-Pillar to the front overhead cabinet. After removing the A-Pillar cover, I could not find the coax. Next step was to remove a forward panel in the passenger side overhead cabinet that has the satellite switch attached to it. Inside, with the help of a camera (I am going to purchase an inspection camera one of these days) I was able to see a coax junction block, with all ports filled. I was able to reach in and find a "loose" coax that was connected only to the junction block. The other end was free and I was able to put it through the existing cut out, into the front cabinet. This was a joyful moment. I was not going to have to run another coax cable. I searched around the best I could, hoping to find that the composite video cable and audio cables had also been installed, no luck. Well, I really just wanted the OTA antenna, and with luck, I should be able to get satellite through the coax from the switch (though satellite to the rear TV from the switch has not worked). So now it was on to installing the mounting bracket for the TV. Since this post is long with lots of pictures, I will break here and continue with another post. Photo one - the front overhead cabinet from the factory. Photo five - cable coming out the access into the front overhead cabinet.